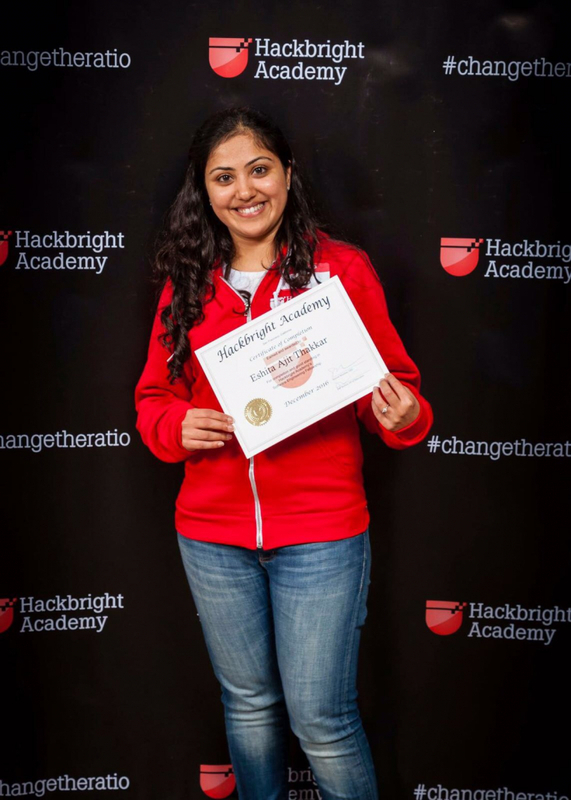 Eshita Thakkar graduated Hackbright Academy in December 2017, ready to pursue her new career. Shortly after graduating, Eshita accepted a job as a Software Engineer at Thuuz Sports, a personalized sports entertainment platform. Read more about her journey below! What inspired you to get into software engineering? Coming from an electrical engineering background and having worked as an IC Design Engineer, I felt something was missing– I wanted something more fast-paced. In my previous role, I had written scripts to automate items and I found programming to be a lot of fun. I decided to move to software engineering because of the flexibility and ability to see impact in a much shorter product cycle, as well as its dominance in Silicon Valley. Once I made up my mind to move to software, I decided to take introductory programming courses. I did some research online and shortlisted Stanford Engineering Everywhere’s ‘Programming Methodology’ course. This course developed my interest in object-oriented design. The course was in Java, though. I had used Python at my previous job for scripting and had enjoyed coding in it. I decided to learn it in-depth and did an introductory course in Python on Coursera. I still felt I needed a more face-to-face learning experience in a classroom environment. This is when I started looking for bootcamps online. I did a thorough research on three to four big names in the Bay Area on aspects like what they had to offer, commitment and reviews. I also attended their info sessions. Hackbright impressed me; it met my expectations, and the best part was I believed (and still believe) in their mission to ‘change the ratio.’ It was a perfect fit. It was the only bootcamp I applied to and I was accepted on the first go. How did Hackbright’s culture and environment empower you to become successful? Hackbright has a very supportive and encouraging culture where your classmates don’t compete with you. They stand by you instead of pulling you down. In such an environment, you always grow and learn from each other. The staff instills the confidence in your ideas and helps you do your justice to the best of your ability. I met wonderful women from diverse backgrounds who were passionate and hungry to learn, who have now become my friends for life. Hackbright also has a strong community that is resourceful, provides mentoring and has a great reputation in the industry. It is an honor now to be a part of it. How did HB prepare you for the job search after graduating? Whiteboarding sessions with the teaching staff as well as whiteboarding events that were organized at different companies were super helpful. This is as close as it can get to a real interview. Weekly career services sessions helped me beef up my resume, improve my job search strategy, removed fear of technical interviews and taught me how to negotiate salary. Talks from industry experts were valuable as that brought in industry perspective. Hackbright cares for its students even after they graduate. I get weekly emails about conferences, webinars, meetups and hackathons. In my experience, that list is super handy to have. What’s your advice to those trying to make a career change to Software Engineering? Having a thought to make a career move in itself is courageous. Don’t be reluctant to take the next step by waiting for the right moment. If you want to do it just go for it. It’s a decision you will never regret. I have never been happier — I truly enjoy what I’m doing.